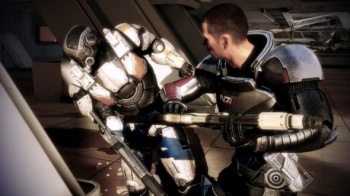 BioWare's Casey Hudson explains the differences between the action, roleplaying and storymodes in Mass Effect 3. You may already know that the upcoming Mass Effect 3 will offer gamers a choice of action, story and roleplaying modes before the action gets underway. But do you know what the differences are? Okay, the concepts may be fairly self-evident but just to be certain, Mass Effect 3 Director Casey Hudson broke it down for Game Informer. "We realized that it's not ideal that when someone starts the game, they don't know that much about it and we dump a huge options screen on them. Automatic squad powers and this and that - you're asking them to make too many decisions about stuff they haven't even played yet," Hudson explained. BioWare has received feedback from players who love what they've seen of the Mass Effect setting but have avoided the games because they're terrible at shooter combat, he said, while still others think the story is fantastic but go nuts with stress and fear that they're somehow going to make the wrong decision and screw something up. Thus, different types of game modes for different types of players. "All these settings do is that they set some of the options on the option screen before you've played it and know what those options mean. Once you get in and start playing, you can change things," he said. "The story mode is actually just a difficulty setting. The action mode is actually just about choosing 'automatic dialogue'." It's still possible to die in story mode, it's just quicker and easier to blow through the combat and get back to the serious business of macking on Jack. "You get through it faster. You can mow through enemies," he added. "Generally, if you're trying, you're not going to die." Action mode, meanwhile, puts players on a "default path" that blends Paragon and Renegade actions, but Hudson was quick to clarify that "default" does not mean canon. "We have a rule in our franchise that there is no canon. You as a player decide what your story is," he said. "But we choose a default path that gives you access to a lot of cool things. It's like how a character like Jack Bauer has to make some decisions where he feels empathy in one moment or feels particularly brutal in another moment. We weave you through a default path that switches between those." Hudson didn't get into the details of the roleplaying mode but the safe assumption is that it will be the standard shooter/RPG blend of the previous games. That's where my flag will be planted; I want to shoot people and shoot the breeze, and I don't need any help with either. Mass Effect 3 comes out on March 6 for the Xbox 360, PlayStation 3 and PC.